I’ve told you over and over that I struggle with comparing myself to others. It may seem harmless to look with envy at the athletes/models in magazines or at the fit women in my gym, but it isn’t because every time I do that I come up lacking. Whenever I fall back into the habit of comparing myself to others or envying what they have achieved, I always end up feeling disappointed, discouraged, and, quite often, depressed. You see, there is a great difference between comparing myself to someone and being inspired by her. When my motivation is envy, I cannot learn from that athlete/model in the magazine because envy forces me to find or create explanations for why she is so much better than I am. These explanations may be as harmless as she has better genes for this than I do, this is her full time job, or may be as negative as noting that she could not have achieved this look without plastic surgery or photo-shopping. And, when I’m around real people who are much more than images on a page, not only can I not be inspired by them or learn from them, I am not able to develop true and lasting relationships with these amazing women because envy, comparison, and insecurity sole intention is isolating me from others. For me, comparing myself is a habit that pokes it’s ugly head up when I least expect it. I can walk out of my house feeling as if I’ve never been prettier only to arrive at a party to discover that I am surrounded by women who are prettier, fitter, and dressed better than I am. What do I do then? And I am more than willing to be your friend! When I do long distance cycling or take long walks, I have to find ways to fight boredom. Some people like to listen to music and that has it place in my routine. But for those really long rides, I like to listen to NPR or books. Today, I listened to the Diane Rehm Show. 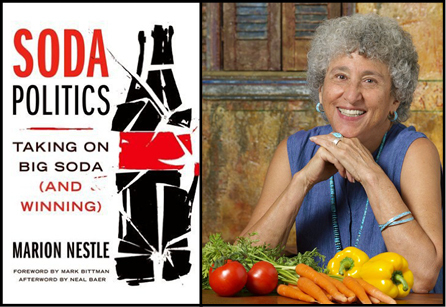 Her guest was Marion Nestle who has recently written a book titled, Soda Politics. I found the conversation to very intriguing. I’d like to invite you to listen to the show and let me know what you think.